Money may take a physical form as in coins and notes, or may exist as a written or electronic account. It may have intrinsic value (commodity money), be legally exchangeable for something with intrinsic value (representative money), or only have nominal value (fiat money). The invention of money took place before the beginning of written history. Consequently any story of how money first developed is largely based on conjecture and logical inference. The significant evidence establishes many things were bartered in ancient markets that could be described as a medium of exchange. These included livestock and grain – things directly useful in themselves – but also merely attractive items such as cowrie shells or beads were exchanged for more useful commodities. However, such exchanges would be better described as barter, and the common bartering of a particular commodity (especially when the commodity items are not fungible) does not technically make that commodity "money" or a "commodity money" like the shekel – which was both a coin representing a specific weight of barley, and the weight of that sack of barley. Due to the complexities of ancient history (ancient civilizations developing at different paces and not keeping accurate records or having their records destroyed), and because the ancient origins of economic systems precede written history, it is impossible to trace the true origin of the invention of money and the transition from "barter systems" to the "monetary systems". Further, evidence in the histories supports the idea that money has taken two main forms divided into the broad categories of money of account (debits and credits on ledgers) and money of exchange (tangible media of exchange made from clay, leather, paper, bamboo, metal, etc.). Regarding money of account, the tally stick can reasonably be described as a very primitive ledger – the oldest of which dates to the Aurignacian, about 30,000 years ago. While it may not be reasonable to conclude the most ancient tally sticks were used to keep accounting records in the monetary system sense of the term, their existence does show that "accounting" – keeping a written record of things counted – is far more ancient than many people assume. The 20,000-year-old Ishango Bone - found near one of the sources of the Nile in the Democratic Republic of Congo - seems to use matched tally marks on the thigh bone of a baboon for correspondence counting. Accounting records -- in the monetary system sense of the term accounting -- dating back more than 7,000 years have been found in Mesopotamia, and documents from ancient Mesopotamia show lists of expenditures, and goods received and traded and the history of accounting evidences that money of account pre-dates the use of coinage by several thousand years. David Graeber proposes that money as a unit of account was invented when the unquantifiable obligation "I owe you one" transformed into the quantifiable notion of "I owe you one unit of something". In this view, money emerged first as money of account and only later took the form of money of exchange. Regarding money of exchange, the use of representative money historically pre-dates the invention of coinage as well. In the ancient empires of Egypt, Babylon, India and China, the temples and palaces often had commodity warehouses which made use of clay tokens and other materials which served as evidence of a claim upon a portion of the goods stored in the warehouses. Because these tokens could be redeemed at the warehouse for the commodity they represented, they were able to be traded in the markets as if they were the commodity or given to workers as payment. While not the oldest form of money of exchange, various metals (both common and precious metals) were also used in both barter systems and monetary systems and the historical use of metals provides some of the clearest illustration of how the barter systems gave birth to monetary systems. The Romans' use of bronze, while not among the more ancient examples is well documented, and it illustrates this transition clearly. First, the "aes rude" (rough bronze) was used. This was a heavy weight of unmeasured bronze used in what was probably a barter system—the barter-ability of the bronze was related exclusively to its usefulness in blacksmithing and it was bartered with the intent of being turned into tools. The next historical step was bronze in bars that had a 5-pound pre-measured weight (presumably to make barter easier and more fair), called "aes signatum" (signed bronze), which is where debate arises between if this is still the barter system or now a monetary system. Finally, there is a clear break from the use of bronze in barter into its undebatable use as money because of lighter measures of bronze not intended to be used as anything other than coinage for transactions. The aes grave (heavy bronze) (or As) is the start of the use of coins in Rome, but not the oldest known example of metal coinage. The earliest ideas included Aristotle's "metallist" and Plato's "cartalist" concepts, which Joseph Schumpeter integrated into his own theory of money as forms of classification. Specifically, the Austrian economist attempted to develop a catallactic theory of money out of Claim Theory. Schumpeter's theory had several themes but the most important of these involve the notions that money can be analyzed from the viewpoint of social accounting and that it is also firmly connected to the theory of value and price. There are at least two theories of what money is and these can influence the interpretation of historical and archeological evidence of early monetary systems. The commodity theory of money (money of exchange) is preferred by those who wish to view money as a natural outgrowth of market activity. Others view the credit theory of money (money of account) as more plausible and may posit a key role for the state in establishing money. The Commodity theory is more widely held and much of this article is written from that point of view. Overall, the different theories of money developed by economists largely focus on functions, use, and management of money. Other theorists also note that the status of a particular form of money always depends on the status ascribed to it by humans and by society. For instance, gold may be seen as valuable in one society but not in another or that a bank note is merely a piece of paper until it is agreed that it has monetary value. In Politics Book 1:9 (c. 350 BC) the Greek philosopher Aristotle contemplated the nature of money. He considered that every object has two uses: the original purpose for which the object was designed, and as an item to sell or barter. The assignment of monetary value to an otherwise insignificant object such as a coin or promissory note arises as people acquired a psychological capacity to place trust in each other and in external authority within barter exchange. With barter, an individual possessing any surplus of value, such as a measure of grain or a quantity of livestock, could directly exchange it for something perceived to have similar or greater value or utility, such as a clay pot or a tool, however, the capacity to carry out barter transactions is limited in that it depends on a coincidence of wants. For example, a farmer has to find someone who not only wants the grain he produced but who could also offer something in return that the farmer wants. Finding people to barter with is a time-consuming process and this factor is most likely the main driving force in the creation of monetary systems -- people seeking a way to stop wasting their time looking for someone to barter with. There is no evidence, historical or contemporary, of a society in which barter is the main mode of exchange. However, the general presumption that monetary systems evolved from barter systems persists because it is unreasonable to presume that monetary systems magically appeared. The psychological elements required for a barter system to exist and function are not only far simpler than those required for a simple monetary system, but every historical example of monetary systems requires and incorporates the basic psychological elements that make barter possible. It is very simple to trade a piece of meat for a piece of fruit (even a caveman can do it), but to create and use tools to make hash marks on a stick or piece of leather to represent that someone gave you a piece of meat and now you owe them a piece of meat is a far more complex set of thought processes requiring a knowledge of making tools, knowledge of crude numerical systems, etc.. Even more intellectually complicated than this example would be creating tokens that abstractly represented a claim on goods stored in a warehouse, and further still, creating metal tokens (which would require knowledge of mining & refining metal and creating coins) requires an even more evolved state of mind than any of these other examples. In his book Debt: The First 5,000 Years, anthropologist David Graeber argues against the suggestion that money was invented to replace barter. The problem with this version of history, he suggests, is the lack of any supporting evidence. His research indicates that "gift economies" were common, at least at the beginnings of the first agrarian societies, when humans used elaborate credit systems. Graeber proposes that money as a unit of account was invented the moment when the unquantifiable obligation "I owe you one" transformed into the quantifiable notion of "I owe you one unit of something". In this view, money emerged first as credit and only later acquired the functions of a medium of exchange and a store of value. Graeber's criticism partly relies on and follows that made by Michell A. Innes in his 1913 pamphlet "What is money?". Innes refutes the barter theory of money, by examining historic evidence and showing that early coins never were of consistent value nor of more or less consistent metal content. Therefore he concludes that sales is not exchange of goods for some universal commodity, but an exchange for credit. He argues that "credit and credit alone is money". Anthropologist Caroline Humphrey examines the available ethnographic data and concludes that "No example of a barter economy, pure and simple, has ever been described, let alone the emergence from it of money; all available ethnography suggests that there never has been such a thing". There are various social theories concerning gift economies. Some consider the gifts to be a form of reciprocal altruism, where relationships are created through this type of exchange. Another interpretation is that implicit "I owe you" debt and social status are awarded in return for the "gifts". Consider for example, the sharing of food in some hunter-gatherer societies, where food-sharing is a safeguard against the failure of any individual's daily foraging. This custom may reflect altruism, it may be a form of informal insurance, or may bring with it social status or other benefits. After the domestication of cattle and the start of cultivation of crops in 9000–6000 BC, livestock and plant products were used as money. The Mesopotamian civilization developed a large-scale economy based on commodity money. The shekel was the unit of weight and currency, first recorded c. 3000 BC, referring to a specific weight of barley, and equivalent amounts of silver, bronze, copper etc. The Babylonians and their neighboring city states later developed the earliest system of economics as we think of it today, in terms of rules on debt, legal contracts and law codes relating to business practices and private property. Money was not only an emergence[clarification needed], it was a necessity. The Code of Hammurabi, the best-preserved ancient law code, was created c. 1760 BC (middle chronology) in ancient Babylon. It was enacted by the sixth Babylonian king, Hammurabi. Earlier collections of laws include the code of Ur-Nammu, king of Ur (c. 2050 BC), the Code of Eshnunna (c. 1930 BC) and the code of Lipit-Ishtar of Isin (c. 1870 BC). These law codes formalized the role of money in civil society. They set amounts of interest on debt, fines for "wrongdoing", and compensation in money for various infractions of formalized law. The first mention in the Bible of the use of money is in the Book of Genesis in reference to criteria for the circumcision of a bought slave. Later, the Cave of Machpelah is purchased (with silver) by Abraham, some time after 1985 BC. The currency was also in use amongst the Philistine people of the same period. 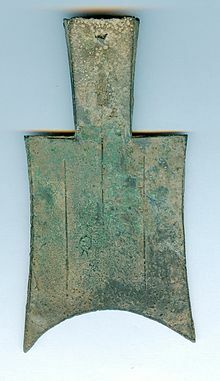 From about 1000 BC, money in the form of small knives and spades made of bronze was in use in China during the Zhou dynasty, with cast bronze replicas of cowrie shells in use before this. The first manufactured actual coins seem to have appeared separately in India, China, and the cities around the Aegean Sea between 700 and 500 BC. 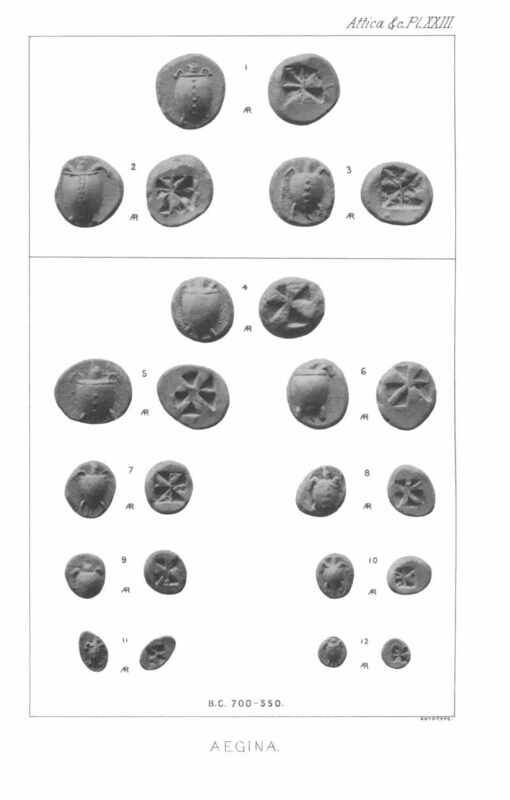 While these Aegean coins were stamped (heated and hammered with insignia), the Indian coins (from the Ganges river valley) were punched metal disks, and Chinese coins (first developed in the Great Plain) were cast bronze with holes in the center to be strung together. The different forms and metallurgical processes imply a separate development. All modern coins, in turn, are descended from the coins that appear to have been invented in the kingdom of Lydia in Asia Minor somewhere around the year 600 BC and that spread throughout Greece in the following centuries: disk-shaped, made of gold, silver, bronze or imitations thereof, with both sides bearing an image produced by stamping; one side is often a human head. The first ruler in the Mediterranean known to have officially set standards of weight and money was Pheidon. Minting occurred in the late 7th century BC amongst the Greek cities of Asia Minor, spreading to the Greek islands of the Aegean and to the south of Italy by 500 BC. The first stamped money (having the mark of some authority in the form of a picture or words) can be seen in the Bibliothèque Nationale in Paris. It is an electrum stater of a turtle coin, coined at Aegina island. This coin dates to about 700 BC. Other coins made of electrum (a naturally occurring alloy of silver and gold) were manufactured on a larger scale about 650 BC in Lydia (on the coast of what is now Turkey). Similar coinage was adopted and manufactured to their own standards in nearby cities of Ionia, including Mytilene and Phokaia (using coins of electrum) and Aegina (using silver) during the 6th century BC, and soon became adopted in mainland Greece, and the Persian Empire (after it incorporated Lydia in 547 BC). The use and export of silver coinage, along with soldiers paid in coins, contributed to the Athenian Empire's dominance of the region in the 5th century BC. The silver used was mined in southern Attica at Laurium and Thorikos by a huge workforce of slave labour. A major silver vein discovery at Laurium in 483 BC led to the huge expansion of the Athenian military fleet. A touchstone allows the amount of gold in a sample of an alloy to been estimated. In turn this allows the alloy's purity to be estimated. This allows coins with a uniform amount of gold to be created. Coins were typically minted by governments and then stamped with an emblem that guaranteed the weight and value of the metal. However, as well as intrinsic value coins had a face value. Sometimes governments would reduce the amount of precious metal in a coin (reducing the intrinsic value) and assert the same face value, this practice is known as debasement. 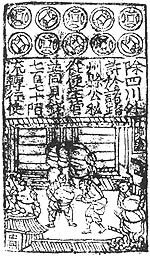 Earliest banknote from China during the Song Dynasty which is known as "Jiaozi"
In the 13th century, paper money became known in Europe through the accounts of travelers, such as Marco Polo and William of Rubruck. Marco Polo's account of paper money during the Yuan dynasty is the subject of a chapter of his book, The Travels of Marco Polo, titled "How the Great Kaan Causeth the Bark of Trees, Made into Something Like Paper, to Pass for Money All Over his Country." In medieval Italy and Flanders, because of the insecurity and impracticality of transporting large sums of money over long distances, money traders started using promissory notes. In the beginning these were personally registered, but they soon became a written order to pay the amount to whomever had it in their possession. These notes can be seen as a predecessor to regular banknotes. The first European banknotes were issued by Stockholms Banco, a predecessor of Sweden's central bank Sveriges Riksbank, in 1661. These replaced the copper-plates being used instead as a means of payment, although in 1664 the bank ran out of coins to redeem notes and ceased operating in the same year. The development of computer technology in the second part of the twentieth century allowed money to be represented digitally. By 1990, in the United States all money transferred between its central bank and commercial banks was in electronic form. By the 2000s most money existed as digital currency in banks databases. In 2012, by number of transaction, 20 to 58 percent of transactions were electronic (dependant on country). In 2008, Bitcoin was proposed by an unknown author/s under the pseudonym of Satoshi Nakamoto, it was implemented the same year. Its use of cryptography allowed the currency to have a trustless, fungible and tamper resistant distributed ledger called a blockchain. It became the first widely used decentralized, peer-to-peer, cryptocurrency. Other comparable systems had been proposed since the 1980s. The protocol proposed by Nakamoto solved what is known as the double-spending problem without the need of a trusted third-party. ^ Hoang, Paul; Ducie, Margaret (9 April 2018). Cambridge IGCSE and O Level Economics 2nd edition. Hodder Education. ISBN 9781510420205. ^ a b Charles F. Horne (1915). "The Code of Hammurabi : Introduction". Yale University. Archived from the original on 8 September 2007. Retrieved 14 September 2007. ^ a b Graeber, David (12 July 2011). Debt: The First 5,000 Years. ISBN 1-933633-86-7. ^ a b Graeber, David (26 August 2011). "What is Debt? – An Interview with Economic Anthropologist David Graeber". ^ Robert A. Mundell, The Birth of Coinage, Discussion Paper #:0102-08, Department of Economics, Columbia University, February 2002. ^ a b Moseley, F (2004). Marx’s Theory of Money: Modern Appraisals. New York: Palgrave Macmillan. p. 65. ISBN 9781403936417. ^ von Mises, Ludwig (2013). The Theory of Money and Credit. New York: Skyhorse Publishing. p. 472. ISBN 9781620871614. ^ Swedberg, Richard (2007). Joseph A. Schumpeter: His Life and Work. Malden, MA: Polity Press. p. 1902. ISBN 9780745668703. ^ a b Coeckelbergh, Mark (2015). Money Machines: Electronic Financial Technologies, Distancing, and Responsibility in Global Finance. Burlington, VT: Ashgate Publishing, Ltd. p. 98. ISBN 9781472445087. ^ N. K. Lewis (2001). Gold: The Once and Future Money. John Wiley & Sons, 4 May 2007. ISBN 0470047666. Retrieved 4 June 2012. ^ a b D Kinley (2001). Money: A Study of the Theory of the Medium of Exchange. Simon Publications LLC, 1 September 2003. ISBN 193251211X. Retrieved 4 June 2012. ^ a b Humphrey, Caroline. 1985. "Barter and Economic Disintegration". Man, New Series 20 (1): 48–72. ^ Innes, Michell A. 1913. "What is Money ?". The Banking Law Journal (May): 377–408. ^ Cheal, David J (1988). "1". The Gift Economy. New York: Routledge. pp. 1–19. ISBN 0-415-00641-4. Retrieved 18 June 2009. ^ Hill, Mark Andrew (2012). The Benefit of the Gift: Social Organization and Expanding Networks of Interaction in the Western Great Lakes Archaic. Ann Arbor: International Monographs in Prehistory. p. 4. ISBN 9781879621442. ^ a b "What is Debt? – An Interview with Economic Anthropologist David Graeber". Naked Capitalism. ^ Gifford Pinchot – The Gift Economy Archived 18 July 2009 at the Wayback Machine. Context.org (2000-06-29). Retrieved on 2011-02-10. ^ Roy Davies & Glyn Davies (3 June 2012). A Comparative Chronology of Money. ^ Ludwig Von Mises (1963). The Theory of Money and Credit. Ludwig von Mises Institute, 2009. ISBN 1933550554. Retrieved 6 October 2012. ^ O'Sullivan, Arthur; Steven M. Sheffrin (2003). Economics: Principles in action. Upper Saddle River, New Jersey 07458: Pearson Prentice Hall. p. 246. ISBN 0-13-063085-3. ^ Sheila C. Dow (2005), "Axioms and Babylonian thought: a reply", Journal of Post Keynesian Economics 27 (3), pp. 385–391. ^ The Reforms of Urukagina. History-world.org. Retrieved on 2011-02-10. ^ secondary – Jean Andreau (Director of Studies at the École pratique des hautes études, Paris) (14 October 1999). Banking and Business in the Roman World. Cambridge University Press, 14 October 1999. ISBN 9780521389327. Retrieved 9 April 2012. ^ Schaps, David M. "The Invention of Coinage in Lydia, in India, and in China" (PDF). XIV International Economic History Congress, Helsinki 2006. Session 30. Retrieved 31 July 2018. ^ Full text of "The earliest coins of Greece proper". archive.org. Retrieved on 2011-02-10. ^ a b L Adkins, R A Adkins (1998). Handbook to Life in Ancient Rome. Oxford University Press, 16 July 1998. ISBN 0195123328. Retrieved 9 June 2012. ^ Goldsborough, Reid. "World's First Coin"
^ a b M M Postan, E Miller (1896). The Cambridge Economic History of Europe: Trade and industry in the Middle Ages. Cambridge University Press, 28 August 1987. ISBN 0521087090. ^ William Arthur Shaw (1987). The History of Currency, 1252–1896. Library of Alexandria, 1967. ISBN 1465518878. Retrieved 4 June 2012. ^ "Sir Isaac Newton's state of the gold and silver coin (25 September 1717)". Pierre Marteau. ^ "Mineral Profiles" (PDF). U.S. Geological Survey. ^ Daniel R. Headrick (1 April 2009). Technology: A World History. Oxford University Press. pp. 85–. ISBN 978-0-19-988759-0. ^ Ebrey et al., 156. ^ Thus by the 19th century "[i]n ordinary cases of deposits of money with banking corporations, or bankers, the transaction amounts to a mere loan or mutuum, and the bank is to restore, not the same money, but an equivalent sum, whenever it is demanded". Joseph Story, Commentaries on the Law of Bailments (1832, p. 66) and "Money, when paid into a bank, ceases altogether to be the money of the principal (see Parker v. Marchant, 1 Phillips 360); it is then the money of the banker, who is bound to return an equivalent by paying a similar sum to that deposited with him when he is asked for it." Lord Chancellor Cottenham, Foley v Hill (1848) 2 HLC 28. ^ Richards. The usual denomination was 50 or 100 pounds, so these notes were not an everyday currency for the common people. ^ Eveleth, Rose (24 July 2015). "The truth about the death of cash". BBC. Retrieved 4 December 2018. ^ S., L. (2 November 2015). "Who is Satoshi Nakamoto?". The Economist explains. The Economist. Retrieved 3 November 2015. ^ . Nakamoto, Satoshi (2008). "Bitcoin: A Peer-to-Peer Electronic Cash System" (PDF). ^ "All Cryptocurrencies | CoinMarketCap". coinmarketcap.com. Retrieved 31 December 2017. ^ "Comparing Bitcoin and Other Cryptocurrencies by 'Market Cap' Can Be Very Misleading". forbes.com. ^ "M0". Investopedia. Retrieved 20 July 2008. ^ "M2". Investopedia. Retrieved 20 July 2008. ^ "M2 Definition". InvestorWords.com. Retrieved 20 July 2008. ^ "Discontinuance of M3", Federal Reserve, 10 November 2005, revised 9 March 2006. ^ Aziz, John (10 March 2013). "Is Inflation Always And Everywhere a Monetary Phenomenon?". Azizonomics. Retrieved 2 April 2013. ^ Thayer, Gary (16 January 2013). "Investors should assume that inflation will exceed the Fed's target". Macro Strategy. Wells Fargo Advisors. Archived from the original on 14 July 2014. Retrieved 2 April 2013. ^ Carlson, John B.; Benjamin D. Keen (1996). "MZM: A monetary aggregate for the 1990s?" (PDF). Economic Review. Federal Reserve Bank of Cleveland. 32 (2): 15–23. Archived from the original (PDF) on 4 September 2012. Retrieved 2 April 2013. Richards, R. D. Early history of banking in England. London: R. S. King, 1929. Alvarado, Ruben, Follow the Money: The Money Trail Through History, Wordbridge 2013. Jevons, W. S. (1875), Money and the Mechanism of Exchange. London: Macmillan. Menger, Carl, "On the Origin of Money"
Sehgal, Kabir (2015). Coined: The Rich Life of Money and How Its History Has Shaped Us. Grand Central Publishing. ISBN 978-1455578528. Weatherford, Jack (1997), The History of Money. New York: Crown Publishers. The Marteau Early 18th-Century Currency Converter A Platform of Research in Economic History. Historical Currency Conversion Page by Harold Marcuse. Focuses on converting German marks to US dollars since 1871 and inflating them to values today, but has much additional information on the history of currency exchange.